The Regal Moth caterpillar is the largest North American caterpillar reaching up to 14cms in length. 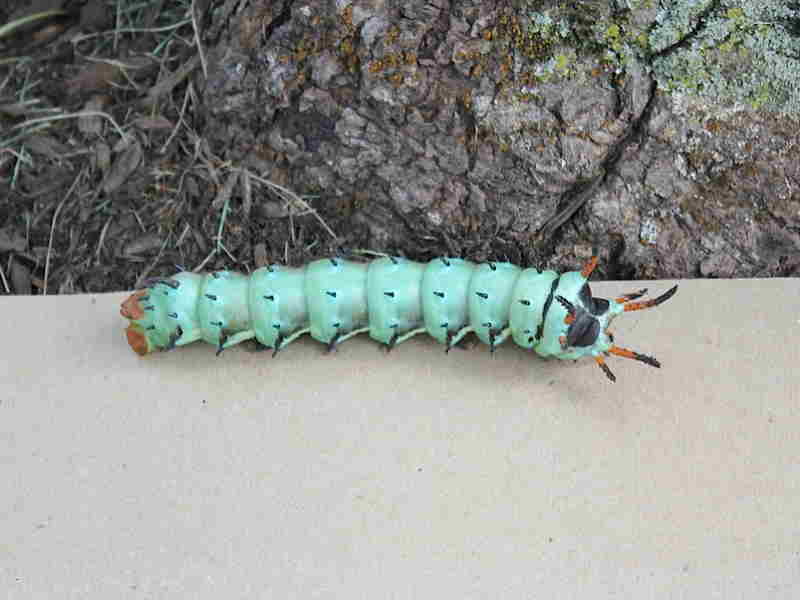 Its fearsome appearance has led to it also being referred to as the Hickory Horned Devil. An undeserving name as the caterpillar is harmless despite the threatening appearance of the horn like projections scattered over its body. This appearance is designed to be sufficiently menacing to deter predators and at a glance the long orange and black tipped protuberances close to its head can give the strange impression of a caterpillar with its legs facing upwards. Thanks go to Jonathan Pace for the images shown of a fully grown Regal Moth caterpillar descending a tree trunk in a cemetery in North Brunswick, New Jersey, Middlesex County in the United States. 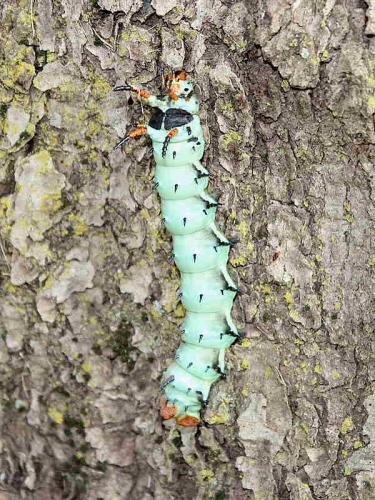 The caterpillars feed on a variety of trees including hickory, walnut, ash, lilac and sycamore with the larval stage lasts for about a month. When fully grown the caterpillar descends the trunk of the tree and wanders off to look for a suitable place to pupate in soft soil. It is when searching for a place to pupate that it is most likely to be encountered. The adult female Regal Moth, also known as the Royal Walnut Moth, is one of the largest moths in North America moths with a wingspan of up to 15.5cms, the male being slightly smaller. In response to increasing caterpillar inquiries from many states in the USA an American caterpillar gallery has been added.